With Pete Rose in town this weekend for his number retirement and induction into the Reds Hall of Fame, plenty is known about his major league career, but not as much about his three years in the minors. To hear people talk about it, it was something to behold, especially the final season, 1962, for the Macon (Ga.) Peaches. “I don’t know how many people know it, but Pete ended my playing career, sent me into managing full time,” recalled former Reds manager Dave Bristol last week. Going into the 1962 season, Bristol was a 28-year-old journeyman, with a solid .283 batting average in 10 minor league seasons. Bristol’s job description at Macon was player-manager. In 139 games — every one that the Peaches played that season (Rose’s buddy Tommy Helms was the only other ’62 Peach to play them all) — Rose hit .330, with 31 doubles, 9 home runs and a league-leading 17 triples and a whopping 136 runs scored. Helms (.340) out-hit Rose, but Pete was 60 points higher in on-base percentage and 65 points better in slugging. 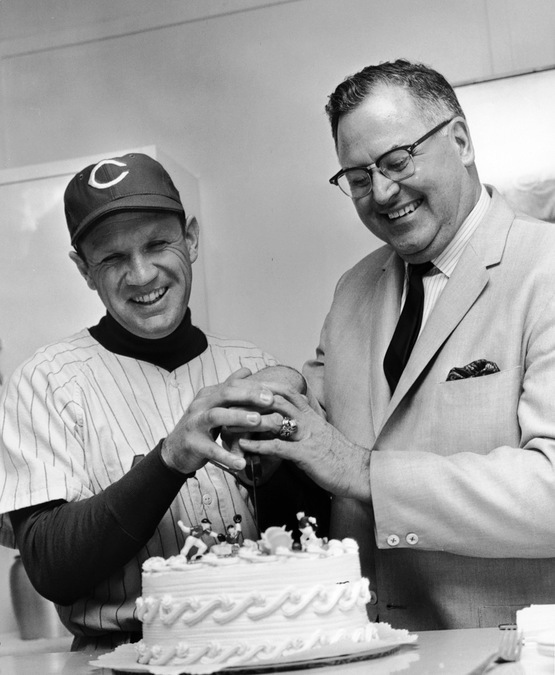 Reds manager Dave Bristol, who was on the Macon (Ga.) Peaches team with Pete Rose in 1962, celebrates the birthday of new Reds general manager Bob Howsam during spring training 1967. Howsam fired Bristol after the 1969 season, and brought in Sparky Anderson. If I could go back in time for any five of Rose’s professional seasons, there is no doubt in my mind that Macon ’62 would be one of them. That team would have been a blast to watch. Something Bristol told me back in 1985 stuck with me, back when he was a coach with Philadelphia. Helms also told me a good story in 1985 about Rose in ’62. Others above Macon might not have seen Rose coming so quickly, but Rose did. During the 1962 Sally League season, he had his parents drive him down a new Corvette when the Peaches played in Knoxville, Tenn. On the way home to Macon, Rose and Helms were stopped for going a bit, ahem, fast. They were stopped by a member of Georgia’s finest, who Helms said told them their fine was however much they had in their pockets. Fortunately, it wasn’t much. Driving fast, pretty girls and baseball were the vogue back then. Besides Rose and Helms, the ’62 Peach position players who would make the big club in the coming seasons were Art Shamsky (team-leading 16 homers) and Mel Queen (35 doubles, and team-leading 93 RBI). So did Rose, who remembers Slaughter being his role model in Rose’s trips to Crosley Field in the early 1950s. Slaughter, a future Hall of Famer, was a 25-35 doubles-a-year guy even in his mid- to late-30s, when Rose watched him play. Slaughter’s 1936 season in the Sally (South Atlantic) League foreshadowed Rose’s season there 26 years later: Slaughter hit .325, and banged in 20 triples, 31 doubles and 9 homers (the last two of those numbers are exact matches of Rose’s), and had a .497 slugging percentage. Longtime Cincinnati sports writer John Erardi is working on a book about the Cincinnati Reds’ connections in Cuba, 1911-1961. The book is due out in the spring of 2017.